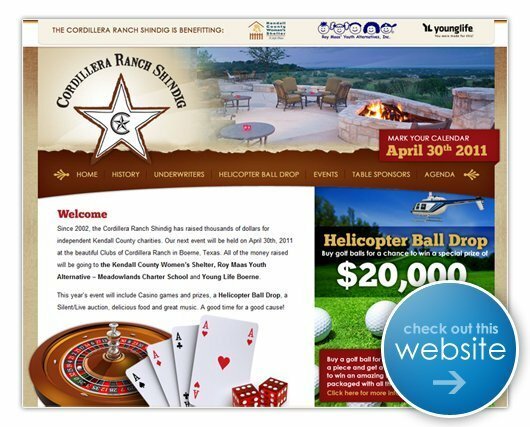 I am excited to share that BlackStone Studio is a proud sponsor for the Cordillera Ranch Shindig event that will be held at The Clubs of Cordillera Ranch, Saturday, April 30, 2011! Since 2002, the Cordillera Ranch Shindig has raised thousands of dollars for independent Kendall County charities. A few months ago, their Co-Chairman Jamie Amerman approached me to see if I would be able to help them with their website. I was so happy to donate my services for such a great event! This is the second time this year that BlackStone Studio has been involved in a charitable event, and I hope to continue finding ways of giving back every year! Please check out their new website which just launched at www.CordilleraRanchShindig.org If you can donate to this great event, please do so as all of the money raised will be going to the Kendall County Women’s Shelter, Roy Maas Youth Alternative – Meadowlands Charter School and Young Life Boerne.